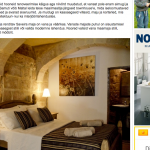 The leading Estonian home magazine Moodne Kodu has featured one of the MaltaVillageHolidays.com properties in its online edition. The 300 year old village home is known as “Saveria” and is located in the village of Naxxar. The article showcases the beautiful Maltese stone and the character of the architecture typical to these types of properties. 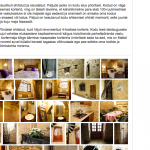 MaltaVillageHolidays.com handpicks quality holiday accommodation properties and markets these to prospective travellers from all over the world.